Description: The flowers are in small, umbel-like clusters below the leaf axils. The individual flowers are small, drooping, and have 5 often reflexed (bent backwards toward the stem), white to purplish lobes and a beak of yellow stamens and a longer style. The flowers are followed by clusters of small, round, shiny black berries with a strongly reflexed green calyx and disk-shaped seeds. The leaves are green, hairy to almost hairless, smooth-edged to coarsely blunt-toothed, alternate, and broadly to narrowly egg-shaped with a pointed tip. The stems are mostly erect, well-branched, and green to tinged purple in color. Here in Hawaii, this plant grows in a wide variety of habitats from low to high elevations. 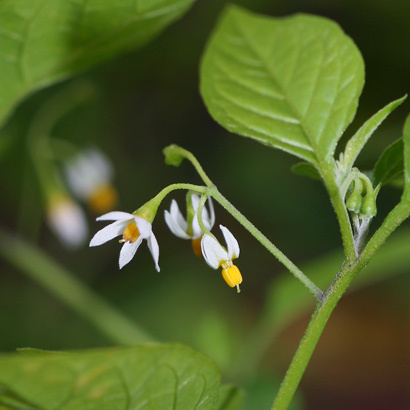 American Black Nightshade is a very important Hawaiian medicinal plant and is still used for this purpose to this day. 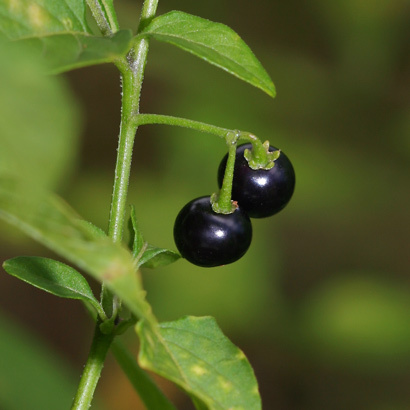 The similar Divine Nightshade (Solanum nigrescens) and Black Nightshade (Solanum nigrum) both have dull, matte black berries. Edible – The fully ripe black berries are edible and were eaten by the Hawaiians. 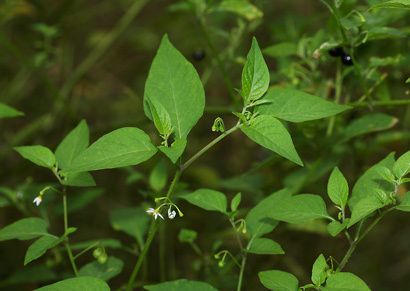 Poisonous – The green berries are poisonous and contain solanine along with other nightshade toxins.